With a lot of luck and perseverance, we should awake on Day 5 to the prospect of having to cover a mere 83 miles to set the Caminho Da Fé speed record. That statement sounds somewhat nuts, but put into the perspective of having covered about 268 miles over the prior 4 days, it doesn’t seem as insane. Day 5, however, will likely be the most difficult day of the lot. Not only will it come on the heels of the Brazil 135 Ultramarathon, it also features the aptly named “Hill of the Broken Leg”. 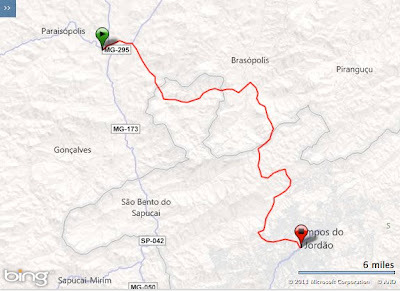 Today’s route begins in Paraisópolis, a municipality located in a very rugged area in the foothills of the Serra da Mantiquerira. Its main industries are automotive, agriculture, livestock and trade. Soon after leaving this “paradise” of a city we will encounter the “Hill of the Broken Leg”. In 2011 we were treated to an amazing meal made for us by one of the local residents. It provided a much needed rest from the grueling climb. Campos do Jordão, a city with an economy based mainly in tourism (due to its location at high elevation and European-looking architecture), features buildings that are primarily German, Swiss or Italian inspired. The other consequence of being at high elevation is that it is relatively cold for Brazilian standards. Our favorite Pousada is located in Campos do Jordão – hopefully our friendly proprietor will be there and remember us!